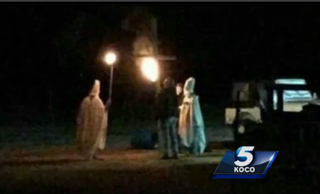 The husband of a mayor in Oklahoma thought it would just be a hilarious laugh when he and friends donned white sheets to dress up as the Ku Klux Klan, complete with burning torches. Lahoma, Okla., Mayor Theresa Sharp is now apologizing for her husband Cary Sharp's actions, which prompted alarm in their neighborhood, KOCO reports. "[It] happened on my property. You know, I don't know what else to say other than I'm sorry to the community and I'm sorry to the public," Theresa Sharp told the news station, which noted that the mayor was holding back tears. "It was the stupidity and actions of four separate individuals, and it does not reflect on me or anyone else who is in the community." Cary Sharp said that the display, complete with hoods, a cross and bonfire, was just for Halloween. And although a cross could be seen in the background, according to Fox 17, Cary Sharp insisted that no cross was burned. "[A] cousin of mine came up with the idea of dressing up like KKK members, and so we took a couple of sheets and cut holes in them and wore the sheets, and it was a very, very poor decision," he said. "I never realized it would have been so harmful," he added. "I truly apologize to everybody for this." Outraged residents are calling for some action to be taken. "It's not OK for anybody," one resident, who did not want to be seen on camera, told KOCO. "The mayor needs to take responsibility for what her husband did." The Garfield County Sheriff's Office said that no crime was committed, while acknowledging that the costumes were in poor taste. However, the sheriff told the station that the case may be turned over to the district attorney's office for review. Watch the segment on KOCO and read more at Fox 17.